HALF BAKED: Where were you on this day 12 years ago? Today is the 12th anniversary of the attacks on the World Trade Center & the Pentagon. 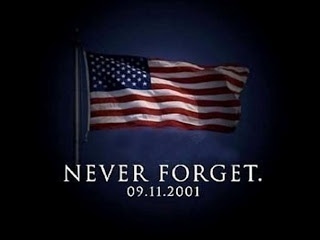 As we take a few moments out of our very busy lives to stop and remember the lost & sacrifice from that horrific day. I want to also remember the sense of community & togetherness that came from it. As I sit here & remember where I was when it happened. I was not with my husband yet. I was in my home getting my (then) baby ready for daycare as well as I was running late to get to school. With the news on like I always do. I remember the news interruption & I was looking at the images coming across the TV thinking no chance this is really happening. It took me hours to wrap my brain around the fact this was actually happening. I still can not even 12 years later understand the "why" of the hatred that caused this. I want everyone to remember not the 12 years the collision has been at war with the Middle East. Or the theories as to why war was declared. Please remember the loss of all from these attacks. The moms, dads, brothers, sisters, aunts, uncles grandparents and children. Please Include the Military Personnel & First responders we have lost since that day defending our freedoms. Most of all Never forget!